Today, we were invited by Bernie and his family to try out a Malaysian restaurant in Surrey. Bernie hails from the Pearl of the Orient, Penang. The restaurant we went to is called Malaysian Hut and is managed by Irene Chang, a baba-nyonya, from Sibu, Sawarak. Irene is a very friendly person who came out and chatted briefly with us. 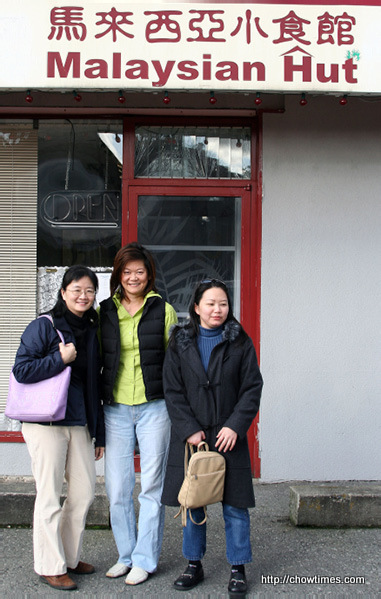 The restaurant has been operating at the 108th Avenue for more than five years. They were featured twice recently in The Province. Anyway, Irene is the tall one in the picture below. We decided to order different types of dishes for sharing so that we all get the chance to try out varieties. So, we ordered Char Koay Teow, Hainanese Chicken Rice, Curry Laksa and Asam Laksa. The servings were pretty generous. 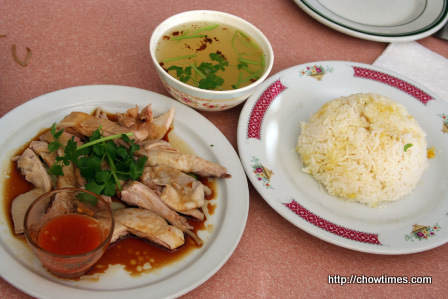 Of all the dishes, the Char Koay Teow and the Hainanese Chicken Rice are the most popular. We ordered an extra serving of rice because there were more chicken leftover. 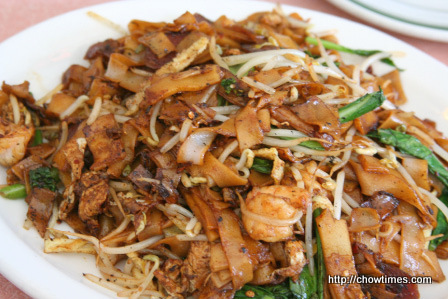 Arkensen and Nanzaro rated the Char Koay Teow a “five”. For me, I will rate the Char Koay Teow a little lower. It is because that dish does not have the two MOST important ingredients: crispy fried lard (gee yow jar) and cockles. Anyway, I have not come across Char Koay Teow so far in Vancouver that has these two ingredients. It is perhaps because Vancouverites are just plain afraid of Hepatitis and clogged arteries! 🙂 I will grudgingly give it a 4.5. The best Char Koay Teow I have tasted was the stall behind the Selangor Emporium in Jalan TAR … I wonder if that stall is still around. 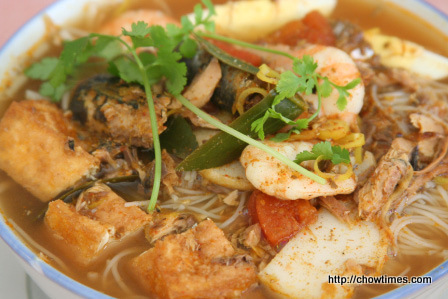 Let me know your favourite place for Char Koay Teow, especially one that has “gee yow jar” and raw cockles! 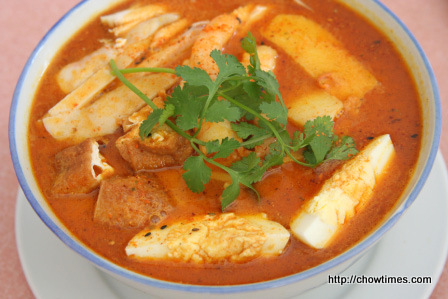 The Curry Laksa is OK but I think it will be much better if it is spicier. Curry Laksa is supposed to be so spicy that you sweat eating it. I must say that the Asam Laksa is pretty disappointing. I guess it’s because the lai fun was substituted with thin vermicelli. Also, we normally expect Asam Laksa to have shredded cucumber, pineapple, onion, asam paste and sardines. Thanks to Bernie, Janice, Ignatius and Cornelius for buying this lunch. It was great meeting up with you all again. Seeing Malaysian cuisine, It makes me miss my home-country, Indonesia. With the 5/5 rating for the Char Kaoy Teow (CKT), Arkensen and Nanzaro will be back for more.The ideal CKT you described sound like the one sold in Lorong Selamat, Penang. It’s RM6 per plate and has more than 10 people queueing at any one time during lunch. The secret I think is in the juicy fresh big prawns and raw cockerels.BTW, there’s a typo for Ignitius, should be Ignatius. Yup, I agree. However, IMO the REAL secret is in the fried crispy lard! Also I used to order with TWO extra eggs.